Welcome to Noah’s Ark Christian Academy! We believe that your child is very special; therefore it is imperative that their day be a fun, interactive learning experience. Our professional teachers and caregivers here at NACA are prepared to meet the specific developmental needs of children 2 to 12 years of age. Through careful planning and individual attention, our goals are to have self-confident children with sharp minds and beautiful hearts. 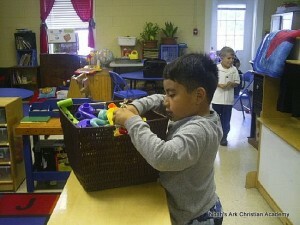 Noah’s Ark Christian Academy is locally owned and operated in Paulding County. I agree that my child will not be allowed to enter or leave the facility without being escorted by us, the parents or an adult that I have authorized. I agree to clock my child in and out each day on the fingerprint reader located by the front lobby. I understand that NACA will enforce Bright From The Start’s policy that no car will be left running unattended. I understand that I am responsible for my child when we are on NACA property. All child care areas are equipped with security cameras. For parents convenience, there are video monitor displayed in the hallway. An appointment with the Center Director must be made if a parent wishes to review prior tapes. No one is allowed to personally record these tapes and are the sole property of NACA. MEDIA/PHOTOGRAPHY POLICY: I understand that my registered child(ren) may be photographed at Noah’s Ark Christian Academy during special events or normal day to day activities organized at Noah’s Ark Christian Academy. I understand that these photographs may be used by Noah’s Ark Christian Academy for social media and office purposes. I understand that their name will not be listed with the photograph for the security of our child(ren). Return to top of FAQ page. Security is extremely important at NACA. Each family will be given a unique security code to allow access into the building. The keypad is located next to the front door. To insure the safety and security of our children please do not share your child’s entrance code with others. If someone other than the parent will be picking up your child, please have him or her ring the bell for admittance. Parents/Guardians are responsible for checking their child in and out each day at NACA. Your family ProCare pass-code will be assigned upon registration. This is a vital step for our security procedures since this enrollment information is uploaded to our local fire/rescue departments in case of an emergency. Children must be escorted by an adult both entering and leaving the building. Only those authorized persons registered in the ProCare system are allowed to pick up your child.. They will need to present a valid driver’s license or state issued picture ID during registration process. A notarized court order must be on file if custody is an issue. In the event that a child has not been picked up by 7:00pm and the parent has not contacted us, we will attempt to reach the parent as well as two individuals listed as emergency contacts. If there is no success in reaching any of these, the authorities will be called. Parents should notify the center if their child will be absent for a medical appointment no later than 8:00 am in the morning; we prefer a 24 hour notice. Noah’s Ark Christian Academy maintains an open door policy. We welcome our families, parents and guardians to catch us doing the “right thing”. Parents and guardians may visit their children in our facility as they wish. Our facility has a secured door and fingerprint recognition system. Please speak to administration should you need assistance with this matter. We do ask parents and guardians who plan to visit their children frequently to follow classroom routine, to avoid disturbing classroom schedules and activities. Please speak to your child’s teacher; we do have a handout that has ideas and suggestions for parents and guardians on ways to meet these goals. If you wish to meet with the Director or a staff member, please make an appointment so that arrangements can be made. Noah’s Ark Christian Academy respects and appreciates parents and guardians valuable input on the care of their children, and encourages family participation. Parents may visit as their schedules (and children) will allow. The open door policy also means that parents and provider can talk together, share information and build a strong relationship that benefits their child. We can talk informally about your child’s progress, mention any concerns, review your child’s work and make sure parents and guardians feel involved. If at any time you feel the need for a formal conference one can and will be scheduled. The parent–teacher conference is an opportunity for parents to learn about their children’s progress in school and for teachers to gain insights into their students’ home and community lives. Parent perspectives on student strengths and needs, learning styles, and non-school learning opportunities can help teachers shape their instructional methods. Noah’s Ark Christian Academy offers two formal Parent-Teachers conferences a year, one in late fall, and another in the spring semester. Please feel free to set any additional conferences during the school year at any other time you may have questions or concerns regarding your child with his/her teacher. Noah’s Ark Christian Academy welcomes all children and is committed to providing developmentally appropriate early learning and development experiences that support the full access and participation of each and every child. We believe that each child is unique and work in partnership with families and other professionals involved with the child to provide the support every child needs to reach their full potential. Children of all abilities are accepted into Noah’s Ark Christian Academy and families interested in having their child attend the program will be given an equal opportunity for admission. A waiting list may be maintained and children will be accepted from the list on a first come first served basis. Early childhood educators at Noah’s Ark Christian Academy use developmentally appropriate practices and consider the unique needs of all children when planning. Staff will make every attempt to make any adaptations or modifications necessary to meet the needs of the children. Schedules, routines and activities are flexible and early childhood educators will work with therapists, special educators and other professionals to integrate individual accommodations, modifications and strategies into classroom routines and activities. Any adaptations will be reviewed with families and other professionals supporting the child. Confidentiality applies to all verbal and written information about potential, enrolling, and previously enrolled children and their families. All staff will be briefed on the need for confidentiality and will be expected to fulfill their obligation to respect the protection of privacy. Written records will be stored in a secure location with access limited to the director and the child’s teacher. No information will be released about a child and the parent/legal guardian during enrollment or transition to another receiving program or school without first receiving the written permission of the parent/guardian. This excludes the responsibility held by early childhood educators as mandated reporters of suspected child abuse and neglect as outlined in Georgia law or when information is subpoenaed by the court. Noah’s Ark Christian Academy acknowledges and respects the priorities each family has for their child. Families are encouraged and supported to collaborate with staff to ensure that each child has an opportunity for optimum success. Noah’s Ark Christian Academy communicated with each family daily and has regular meetings to discuss the child’s successes and challenges. Training and support is provided to ensure that all staff is comfortable, confident and competent to meet the developmental and educational needs of all children. All staff receives an orientation on inclusion policies and attends training focused on effective inclusion and/or other disability topics whenever possible. The director provides additional support and resources as appropriate. Many children with disabilities or other special needs are supported by developmental and educational professionals such as therapists, teachers and others. Program Name Here welcomes those professionals and works with them to assure the child’s success. The service provider is encouraged to provide services to the child in the context of the early childhood classroom environment and the child’s teacher and the service provider work collaboratively to determine the best strategies to support the child in the group setting. Noah’s Ark Christian Academy supports the teacher’s participation in Individualized Family Service Plan (IFSP) and Individualized Education Program (IEP) meetings. NACA uses the ABeka® Curriculum for children ages two and older. Our daily curriculum is one that will instill education, imagination and independence. Daily schedules with the age appropriate activities will be posted in each classroom. Each day shall have active periods, teacher directed activities, free play, hand eye coordination activities, arts and crafts, dramatic play, rhythm and music, nature and science, and quiet time. Toddlers and preschoolers rest in their rooms on assigned mats each day after lunch. The naps are typically from 1 to 2 hours. There will also be outdoor time for each child. There are two age appropriate playgrounds for the children. The children over two are require to have 1 ½ hours of outdoors. If there are medical reasons why your child cannot participate in outdoor activities, please have your physician give a written excuse. The After-School children will have a snack when they arrive at the center and have quiet time for homework. NACA is not responsible for corrections or completion of homework. It remains the parent’s responsibility to check it. Teachers will help assist students as much as possible. Parents must provide their children with the supplies needed to do their homework. All the children at NACA will participate in our Afternoon Enrichment Program which includes: Chapel, Spanish, Performing Arts, Dance, Music, Physical Education, Reading Specialists, Cooking and Nutrition as well as experiments in Science. Additionally, Friday will be a fun behavior reward celebration with special activities. Noah’s Ark Christian Academy behavior management is based on the belief that praise and positive reinforcement are the most effective methods of behavioral molding. It is our goal to guide and direct children to learn which behaviors are acceptable and unacceptable. It is also our goal to communicate clear limits to our children based on what is age appropriate and on target with their individual developmental stage. Praise and positive enforcement are effective methods of the behavior management of children. Our first step is to have a discussion with the children to make sure they understand expectations. When children receive positive, non-violent, and understanding interactions from adults and others, they develop good self-concepts, problem-solving abilities, and self-discipline. Based on this belief of how children learn and develop values. All my actions will show my respect for Jesus”. Redirection Time is the removal of a child for a short period of time from a situation in which the child is misbehaving and has not responded to other discipline techniques. The Redirection Time space, usually a chair, is located away from the focus of activity but within the care provider’s sight. During Redirection Time, the child has a chance to gain control of his or her emotions. It is not used as a punishment but instead an opportunity for the child to calm down, clear their mind and to be able to rejoin the group or activity in a more productive manner. This consequence must follow immediately after the in appropriate behavior and is never humiliating, threatening or frightening. After a brief interval of no more than five minutes (or 1 minute per year of the child), the care provider will discuss the incident and appropriate behavior with the child. When the child returns to the group, the incident is over and the child is treated with the same affection and respect shown the other children. We avoid using Redirection Time for toddler. They do not understand why their behavior is unacceptable, and they should be gently redirected. “Redirection Time,” the child is separated from the group for a period of one minute per year of age. However, the quiet time is not restricted and a variety of activities are available for the child. It may include, play-dough, papers to tear or to draw on, etc. At the end of the child’s time, he or she can choose to continue with any activity they may have started, or rejoin the group without further mention of the incident. The Child will write their own behavioral contact, this contract will be sent home for parental review, signature and returned. IMMEDIATE SUSPENSION AND/OR DISMISSAL: We reserve the right to immediately, temporarily or permanently, exclude any person from the center, including a parent, whom we deem likely to pose a threat or risk to the center or who fails to or refuses to conduct him or herself in a manner befitting a proper child care environment. This includes but is not limited to; profanity, yelling threatening, aggressive or violent behavior, intoxication or failure to follow Noah’s Ark Christian Academy policies and procedures. I understand that my child is required to come to school in the prescribed NACA uniform Monday through Thursday every week. Parents are responsible for the ordering and purchasing of your child’s uniforms from only the vendor listed below. Friday is casual day. Each child must enter the center completely dressed everyday (closed toe shoes at all times and coats included). We ask that you bring two changes of clothing labeled with your child’s name. Those extra outfits can be casual clothes. Please provide a jacket with the child’s name on the inside label for the cooler days. Parents are required to bring disposable diapers, diaper wipes and training pants for their children. NACA is not responsible for any damaged clothing. Please label all items brought into the center for your child. Please check your child’s folder and cubbies everyday. Blankets go home on Fridays for you to laundry and return Mondays. Any food items that you bring in must be store bought with an ingredient and a shelf life label-this is to avoid allergic reactions for those children afflicted with food limitations. NACA agrees to keep me informed of any incidents, including illnesses, injury, adverse reactions to medications, and exposure to communicable diseases that includes my child. Children are not allowed to bring in gum, candy, soda, or any type of food items. We do encourage birthday parties with prior arrangements. Any cake or food items brought in for the celebration must be store bought with an expiration date and ingredient label. Children are not allowed to bring toys to the school except for show and tell days. A special stuffed animal or blanket for nap time is permitted. Weekly menus are posted in advance and are subject to seasonal availability. Food exceptions cannot be made for individual children except in the case of allergies and religious needs. A written statement from a physician is required for children with allergies. Children must play outside on the playground daily, except in inclement weather. Bright From The Start requires that children must play outside twice daily, 30 to 45 minutes depending on age. The State of Georgia requires that all members of daycare facilities report any and all cases of witnessed or suspected child abuse or neglect. We will administer medication to children with a signed note from the parent/guardian and a written order from the child’s physician. You may come to administer medication to your child during the day or, if possible, check with your child’s physician to see if a dose schedule can be arranged that does not involve the hours your child is at NACA. Please note that medication administration does vary according to state regulations. You will need to complete the Authorization for Administration of Medication Form available from the office manager for any/all types of medicine to be administered. All medications must be handed directly to the office manager for proper storage. For safety purposes, medications should not be left in lunch boxes or directly in the child’s cubby. The office manager shall administer medication only at 11:00 am and 3:00 pm in the office. Each time medicine is given, it must be recorded on the Authorization for Administration of Medication form. This form will be filed in the child’s record when completed. All unused medicine will be returned to the parent/guardian. Prescription Medications (e.g. Penicillin) require a note signed by the parent/guardian and a written order from the child’s physician (this may include the label on the medication).The medication must have a current pharmacist’s label that includes your child’s name, dosage, current date, times to be administered, and the name and number of the physician. All medication must be in the original container. Many pharmacists will fill your prescription in two labeled bottles so that one can be left at NACA. You will need to complete the Authorization for Administration of Medication Form, specifying for each dosage and time(s) to be administered for each medication. A medication spoon (for liquid medication) should be provided and have the child’s name written on it. Medication should not be added to the child’s bottle or sippy cup and will not be done even upon parental request. A new note is necessary each time a medication is prescribed. This is also true for medications that are ongoing. Children who have asthma (nebulizers), diagnosed allergies (EpiPens), must have a care plan form their physician on file at NACA that outlines the reason why the child must have the treatment, symptoms of the child’s illness or allergy, and treatment while at NACA. Please note the expiration dates of any medications kept at NACA to be used for emergency purposes, such as EpiPens, so they can be replaced as needed. Non-prescription medications (e.g. Orajel) require a note signed by the parent/ guardian (not to exceed a three-day period) on the day that the medication is to be given, specifying dose, time, and reason for administration. If the medication is not recommended for the age of the child and/or you are requesting that we administer a higher dosage than what is recommended, we will need a written order from the physician. Non-prescription medications exceeding a three-day period will require a written order from the child’s physician, including the child’s name, dosage, current date, times to be administered, symptoms to be given for, duration of administration, and the name and number of the physician. All medication must be in the original container (labeled with your child’s name) with a legible manufacturer’s label and a valid expiration date. You will need to complete an Authorization of Administration of Medication Form specifying the dosage and the time to be administered. A medication spoon (for liquid medication) should be provided with the child’s name written on it. Non-Prescription Topical Ointments (e.g., diaper creams, sunscreen) You will need to complete an Authorization of Administration of Medication Form specifying the dosage and the time to be administered, specifying times and dosage to be administered is required. Duration of administration is not to exceed one year for sunscreen and insect repellants ; duration of administration is not to exceed 90 days for all other non-prescription topical ointments (diaper cream, etc.) Specific state licensing requirements may be more stringent and will be followed accordingly for prescription, non-prescription medications, and non-prescription topical ointments. Note: NACA will not administer acetaminophen or other fever reducing medicines so a child can remain at NACA.The child cannot be readmitted to NACA until s/he has been fever free for at least 24 hours, with no other symptoms and off of fever reducing medications. Noah’s Ark Christian Academy do all we can to promote a healthy environment for your children. We make sure children was their hands before meals, after art projects, after toileting and diapering, after coming in from outside, and after wiping their nose. Staff also washes their hands before serving meals and snacks, and wear latex gloves while diapering and assisting a child with toileting and when coming into contact with any bodily fluids. We also disinfect toddler toys on a daily basis, and our preschool toys are disinfected weekly. These policies, together with your cooperation in keeping a child home when he/she is showing symptoms of illness, will cut down on the spread of illness throughout the center. Children who are ill cannot be appropriately cared for in a childcare setting. Exclusion is merited whenever care exceeds the capability of the teachers or when the child cannot participate in all activities. By maintaining a healthy environment, and a reasonable health policy, all of our children will benefit. If a child does arrive in the morning showing signs of ill health, the program will be unable to accept him/her. The exception to this requirement would be that a licensed physician has examined the child and indicated in writing that there would be no health risk to your child or others, and the child is capable of participating in all activities, including outdoor play. temperature of 101.5 degrees or more accompanied by other behavior changes/symptoms. Fever without behavior change or other symptoms of illness does not necessitate exclusion. Any symptoms of any contagious disease. If a child becomes ill during the day, a parent will be immediately notified. The child will be given the opportunity to rest or have divisional activities in an isolated, supervised area until a designated release person can collect the child. If the child is not picked up within one hour from the time of notification, the emergency contact person will be called. Children who are sent home due to illness will not be readmitted to the school until they have been symptom-free for 24 hours. Therefore a child who is sent home ill cannot return to the school the following day. The exception to this requirement would be that a licensed physician has examined the child and indicated in writing that the child does not present a health threat to themselves for others and is able to participate in all activities. Noah’s Ark Christian Academy is required to file a report with the Department of Health within 24 hours in cases of communicable disease. If a child has not been fully immunized to these diseases due to the child’s age, medical condition or religious belief, he/she will be excluded from the school during the outbreak of a vaccine-preventable disease, as directed by the state department of health. All parents will be informed in writing if a communicable disease is reported. Our classroom is a safe and happy environment: We respect each child’s individual rate and style of learning. We are professional and respectful of the privacy of our children and their families. We do not talk about individual students outside of the classroom. Before coming to the classroom, all volunteers must sign in at the school office. Please check in at the office each time before you join us and wear a visitor’s name tag. This is for the safety of our children and our staff. Always use a soft, friendly voice when working in the classroom. Encourage the children to do as much of the work as they can. Invite them to tell you about what they are doing. Allow a child to try and do all he or she can; then provide the support the child needs to be successful. If you are working with a small group, move from child to child, giving each child special attention and engaging them in conversations. Give positive, encouraging feedback. Please remember to focus on the children and save adult conversations for later. Teachers may not discuss any individual child with a volunteer. Be enthusiastic and enjoy the children. Know that your work makes a difference in the lives of our children and the richness of our classroom. Noah’s Ark Christian Academy is always thinking of safety first, for the staff and children. Our building is constructed of concrete block and is able to with stand very strong winds, severe weather, and other unpleasant conditions. The center is equipped with a central security system as well as fire alarms and a fire extinguisher in each room. In the event of an evacuation, emergency exits are well marked and each classroom has an emergency exit door. Emergency plans are located in every room. Evacuation drills are performed on a regularly schedule basis. NACA will be closed due to inclement weather if the director or owner deem necessary. (If Paulding County Schools are closed, GA Pre-K is closed) For your convenience, you can find NACA closure notifications by: checking with our local TV stations: WSB-TV Channel 2 and WXIA-TV 11 Alive, an email notice will be sent to the current email on file, posted at https://www.facebook.com/NoahsArkChristianAcademy. If dangerous weather makes it necessary to close the center before 7:00pm, you will be notified by email and phone calls so that you can make arrangements to pick up your child. As stated in the NACA Tuition Policy, tuition is due during these closures. In the event of a power failure that affects climate control we are required by Bright From The Start to notify a parent to pick up their children. If a parent cannot be reached, we will contact another person listed on the enrollment form. Field trips are offered for the School age children as a way to learn about their community, and to have fun. The trips will be scheduled in advance and will require a signed permission slip. There must be a permission slip filled out for each field trip. NACA encourages parents to attend the field trips; NACA staff will follow all field trip safety procedures in accordance with the Georgia Department of Early Care and Learning. This Liability Waiver Form must be completed and signed by the parent/guardian and be on file before participation in or traveling to and from any NACA activity. Participation in any activity carries with it certain inherent risks that cannot be eliminated regardless of the care taken to avoid injuries. The specific risks vary from one activity to another, but the risks range from 1) minor injuries such as scratches, bruises and sprains to 2) major injuries such as eye injury or loss of sight, joint or back injuries, heart attacks and concussions to 3) catastrophic injuries including paralysis and death. Please note: NACA operates and is governed by Bright From The Start, Georgia Dept. of Early Care and Learning guidelines. The undersigned hereby releases and forever discharges NACA, its employees, directors, officers, assigns, and attorneys, for any and all claims, demands, actions, causes of action or suits arising out of any injuries, known or unknowns, which have resulted or may in the future result from any participation in or traveling to and from any NACA activity. The undersigned hereby assumes all risk of injury with any such NACA activity, and fully indemnifies and holds harmless NACA employees, directors, officers, assigns, and attorneys from and against each and every liability, loss, cost, damage, and expense, including attorney’s fees, which NACA along with its employees, directors, assigns, and attorneys may incur as a result from any participation in or traveling to and from any NACA activity. The undersigned hereby consents to their child participating in any such NACA activity. If the parent/guardian does not want the child to engage in a specific activity, the parent/guardian must provide a signed doctor’s note./ The parent/guardian will also provide a list of any allergies or medial conditions that may be relevant to a physician in the event of an emergency and authorize a designed individual to make emergency medical decision for their child in the event that they cannot be reached. The undersigned hereby agrees to allow their child to participate in any NACA activities which require trips away from the NACA premises, and as consideration for the benefits derived, I absolve and hold harmless NACA, its representatives and agents from any liability or claim by me, my family, or my child because of any injury to my child while on either the school premises, during transport to and from any NACA activity or during any trips away from the school premises. Acknowledgment of Understanding: I have ready this wavier of liability, assumption of risk, and indemnity agreements, fully understand its terms, and understand that I am giving up substantial rights, including my right to sue. I acknowledge that I am signing the agreement freely and voluntarily, and intend by my signature to be a complete and unconditional release of all liability to the greatest extent of the law. This agreement may be changed or revoked by either party with a written two-week notification. All tuition is collectable to the end date of that notice.